In years gone by, there was nothing more powerful and persuasive than word of mouth marketing when it came to choosing a construction company. Today, however, the way we go about sourcing and locating products and services is very different. If you run a construction business, it’s incredibly beneficial to try and move with the times and embrace new marketing methods that will attract new customers and keep loyal clients on board. If you’ve been reliant on word of mouth marketing alone and you’re keen to learn more about modern marketing in the construction industry, you’ve come to the right place. But the internet can also be an amazingly useful resource for both business owners and consumers. Whether you’re food shopping or you’re looking for a local business to provide you with a service you need, it’s increasingly easy to find what you need by pressing a few buttons and clicking on links. As a business owner, the internet gives you a platform to promote and advertise your business and tell people more about the services you offer. Many of us have asked for recommendations from colleagues, friends or neighbours when choosing a building firm. But today, it’s much more commonplace to look to the internet too for answers. Consumers locate services in their local area using search engines and social media, they can access reviews and testimonials, and they can also learn more about individual businesses and what they offer via a company website. If you’re not already set up with a site or you’ve got a dated website that isn’t doing your company justice, creating a new online presence could be hugely beneficial for your business. Google alone has processed more than 65,781 Google searches today in 1 second – with thousands of those searches looking for businesses in the construction supply chain. This last month in the UK there have been approximately 27 thousand searches for building merchants on Google; timber merchants just under 15 thousand and 14 thousand searches for builders. Offline marketing techniques can still be very effective for building companies, but it’s increasingly important to combine offline and online methods. Clients are now starting their quest to find a local construction firm online, and if you haven’t got a fantastic website, you could lose out to competitors. The first step towards success in marketing in the construction industry lies in designing a website that showcases your business in the best light. Your site should look professional and smart, the pages should be informative and interesting, and the navigation should be simple and swift. Avoid using long paragraphs and text, create pages that link to each other, answer questions, and use images and clips to make the content more engaging. Having a blog is a useful resource, as it gives visitors access to more information and you can optimise the content to make your pages SEO-friendly. This means that your links will appear higher up the page when a customer uses a search engine to look for anything that is related to your business. Include your web address on anything that carries your brand name, for example, vans, trucks and company cars. Social media is very popular these days, and you may benefit from creating profiles and accounts on sites like Facebook. Your page enables people to get in touch with you, you can encourage clients to rate your company, and you can share promotions and events and informative posts about the services you offer. And of course send people to find out more about how great you are on your website. 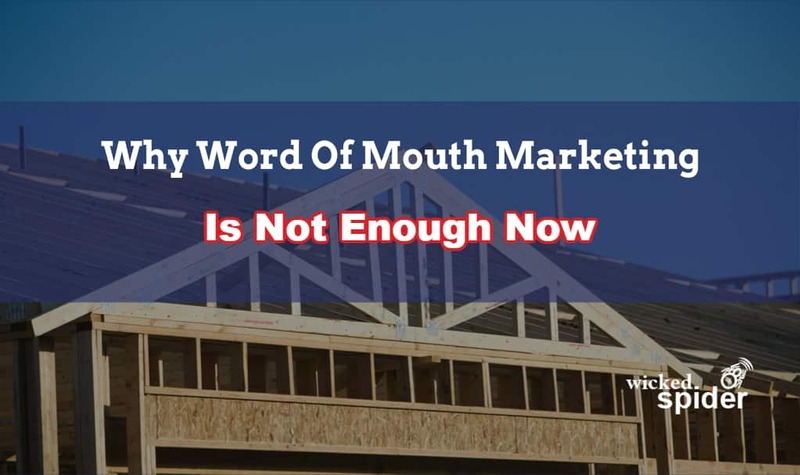 Word of mouth can still be a very useful tool when it comes to marketing in the construction industry. However, you are missing a trick if that is all you reply on and you are losing out on more business if you are not looking at embracing digital marketing. I was with a new client the other day who hasn’t had a new website since 2002. They are getting telephone enquiries and have noted that people are asking more and more for their website address. They are embarrassed to give out the link and realise that they are not giving a good impression online. They have concluded that it is time to have a new website that gives them some credibility online and gives people some up to date information about the business. I am not saying that word of mouth marketing doesn’t work – I’m am saying that it isn’t enough.